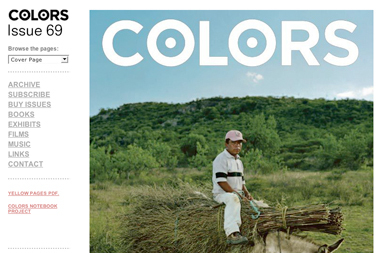 Contributors: www.colorsmagazine.com: Creative Director - Andy Cameron. Art Directors & Developers- Selwa Sweidan & Paolo Eramo. Project Manager - Federica Roncalli. Colors 69 investigates how humans handles what we eat. In cooperation with Terra Madre, a network of 1,500 Slow Food communities, whose mission is to preserve agriculture, local cultures and environment.